Gravadlax sounded like the perfect recipe to come back writing on this blog. I have the great fortune to have found a wonderful fishmonger at the Saint Louis (in Alsace, France) market on saturdays morning: she has everything fished, nothing from farms, and most of the fish is from French part of sea and ocean. She has an outstanding salmon, fished in the Atlantic ocean. So what a better use for a wonderful fish to be cured in the traditional Swedish way? Wash the salmon under fresh water and pat dry. 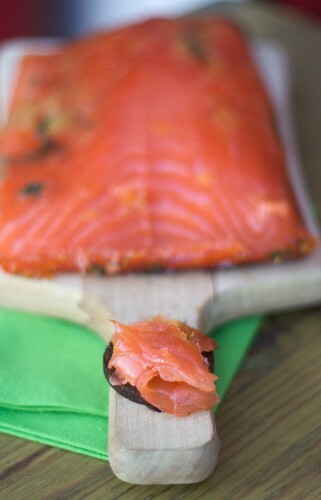 Lay the salmon, skin down, in a glass baking dish. In a bowl mix together salt, sugar and the roughly chopped dill. Directly over the salmon, grate the zest of oranges and lime, then the ginger. Cover with the salt mixture. Cover with film or close hermetically. Let it marinate in the fridge for at least 48 hours. Scrap away all the marinade from the salmon and pat dry. Cut it the thinest you can and serve with black bread. Freely adapted from this recipe, first found on the printed copy, december 2011.